"End of an era", stated one of the rare comments to the news that, on July 9th, Radio B92 was turned off. 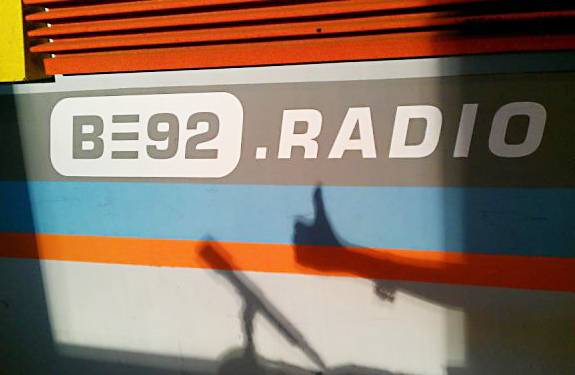 The owners' decision to lay off 11 out of 16 employees and change its name and mission surprised almost no one – it just saddened some nostalgic listeners and confirmed the general opinion that Radio B92 had long since lost its past role and relevance. Founded as a youth radio station on May 15th, 1989, B92 was immediately recognised as something completely different: music not available on other media, news from street culture, and information on political events that had no space in the media of the then regime of Slobodan Milošević. th, 1991, after journalists informed of the government's brutal reaction against the tens of thousands of demonstrators protesting against the regime that had led the country to war and international isolation. As B92, because of weak signal, was only heard in certain parts of the city, it was spared total closure. Belgrade listeners knew that on that frequency they could listen to what pro-government media did not tell. The station's anti-war editorial policy did not just translate into uncensored news. The fifty people who collaborated and worked for B92 at the time did not just cover events, they organised them – e.g., the concert of Belgrade's most famous pacifist rock bands or the collection of aid for the refugees from Krajina, ignored by mainstream media. The explicit link with the then opposition was sufficient to ensure that Radio B92 was banned again. During the three months of mass protests to demand the cancellation of local elections in autumn 1996, led by opposition leader Zoran Đinđić, Vuk Drašković, and Vesna Pešić and the students of the University of Belgrade, the five o' clock news and the covering of protests were retransmitted by other local radio stations. The protests soon spread across the entire Serbia and Radio B92 became the symbol of resistance and independent information for citizens outside the capital as well. This led to its frequency being disturbed, under the excuse that "the coaxial cable was wet". Milošević's spokespeople defined B92 journalists as "forces of chaos and nonsense" and "local traitors paid by foreign agents". A certain amount of pressure followed from the international community, and the officials who came to meetings with Slobodan Milošević would always paid a visit to B92 too. The cable was "dried" and Radio B92 was back until April 2nd, 1999, when in the midst of the NATO bombing it was taken by force by officials of the Socialist Party of Serbia (SPS). In protest, all employees resigned and, in the summer of 1999, they created a new Radio B92, aired by one of the frequencies of the Belgrade radio Studio B. Soon came the fourth ban. In May 2000, special forces raided overnight the premises of Studio B and ended broadcasts. Radio B92 then continued broadcasting from another location, using a repeater out of Serbia, in Bijeljina, Bosnia and Herzegovina. Until the fall of the regime on October 5th, 2000, it remained an essential source of information on all political events and the opposition's as well as the government's positions. It was not just about the information. The musical sound was totally different than on other stations. Artists who could not make it on mainstream media had found their place in B92. The underground culture, the uncensored news, the urban rhythm, a different way of speaking, provocation as a tool of communication with the public, the slogan "don't believe anyone, not even us" – all this contributed to B92's celebrity, including out of Serbia. About 80 international awards for journalism and the books and films on B92 speak for the importance it had in the nineties and not only in Belgrade. This finally ended in 2004, when a joint newsroom was formed between the radio and the B92 television, created immediately after October 5th, 2000. The TV news were read on the radio, reports disappeared, and the provocative tone of broadcasts, including lead political talk show Kažiprst, was moved from radio to television. TV-Radio B92 earned a national frequency and got on a par with other major media. Yet, many journalists, music programming editors, and presenters decided to leave for various reasons, including however a common one – the marketing of radio and television programmes led to B92 losing both its freshness and critical spirit. Many believe that B92 "died" several times – for some, it was when its music started to sound like the mainstream frequencies; for others, when TV B92 started airing the reality show "Big Brother"; for others, when some of the stars switched radios or jobs. It is a fact that the loss of foreign donations, which had kept the radio alive in the nineties, and the fight with competition in a deregulated market led to a series of compromises, concessions, and scheduling changes that of the former splendor left only the brand. The privatisation of B92 was non-transparent and the shares of the owners of the company have changed over time. Since 2010, when the majority stake (84.55%) became the property of Greek-Cypriot Astonko Ltd., the Council for the fight against corruption has warned about the danger of an offshore company in Cyprus owning B92 and TV Prva. Under the recently approved media laws, it is now possible for one subject to own more than one electronic media with national frequency. There are also speculations that these two televisions will be formally merged. There have been no official statements on the future of the company, but a statement on the website announced changes in the summer programming, including "a younger musical concept, commercial programs, and new energy". The commercial content of programmes, at least in Serbia, is measured by the amount of entertainment programmes. In these programmes, even political news must include elements of entertainment, and in Serbia, led by Prime Minister Aleksandar Vučić's Serbian Progressive Party, information is controlled and any critical voice, at least in the electronic media, is censored. For months now, employees of Radio B92 had suspected changes in the content of the programmes – however, they could not imagine they would learn about them from a text message from their banks, informing them of the payment of the salary and severance package for the work done so far. Even some of the authors of music broadcasts who worked pro bono received the following message: "You are probably already aware of the changes implemented to Radio B92 on Thursday, July 9th. To avoid any misunderstanding, changes and termination of all authored broadcasts include Yours." Thus, quietly, Radio B92 disappeared. What you can now listen to on its frequency is called Play Radio. The only reaction by journalists' associations was an enquiry about the possibility of losing the national frequency because of the changes in programming – a possibility also confirmed by Goran Karadžić, president of the Supervisory commission for electronic media. For those listeners who remained loyal to B92 till the end, especially for some music programmes or some authors, this is less important. For those nostalgics who, in the nineties, saw B92 as "window to the world", that radio no longer existed. The trouble is that in Serbia today there is not even the shadow of something that can become what B92 meant up to a decade ago.